A Rake’s Search for a Perfect Bed-Mate! Often whispered about—but rarely spoken of aloud—the startling theme of this story concerns Carroll, a pretty young widow. She is taken into the household of a friendly couple, only to find that her caresses are sought not only by the husband—but by his wife … Should warm, lovely Carroll be condemned for yielding both to the love of a married man, and the equally ardent embraces of a voluptuous though twisted woman? The answer is not simple. True, Carroll responds to their needs, yet it is a haunted, tortured experience . . . despite its warped delights, its moments of almost unearthly bliss. Perhaps she is more to be pitied than condemned. 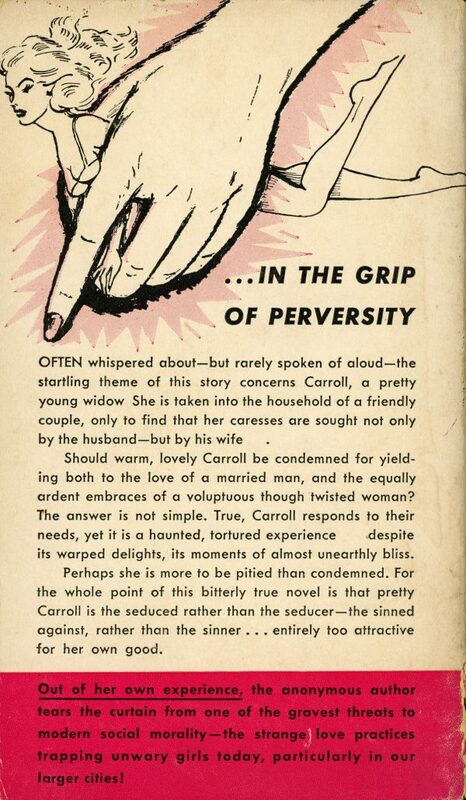 For the whole point of this bitterly true novel is that pretty Carroll is the seduced rather than the seducer—the sinned against, rather than the sinner … entirely too attractive for her own good. Out of her own experience, the anonymous author tears the curtain from one of the gravest threats to modern social morality—the strange love practices trapping unwary girls today, particularly in our larger cities!